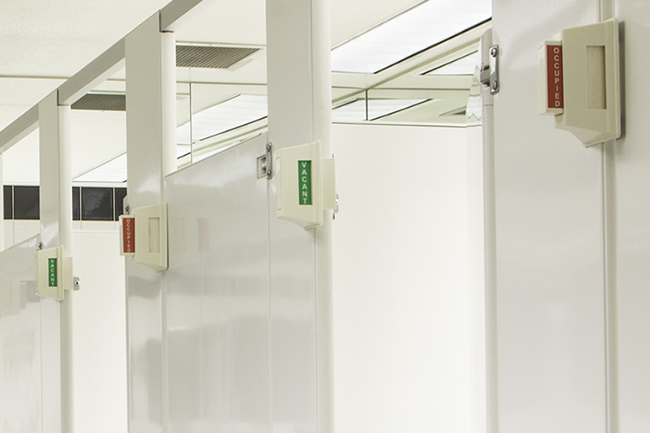 All partitions door privacy covers are in stock for fast delivery. Great for bathroom stall door gaps on both sides of the partition doors. The smoked grey blocks from being able to see in or out. The privacy cover has been available for years and is an inexpensive way to block the gaps. We are now selling Peep No More Indicators for bathroom partition doors. This helps the user determine if someone is in the toilet stall. For other options of blocking any gaps you can use continuous aluminum or stamped stainless steel full channels. Also offering continuous aluminum door stops for toilet partition doors. The full length door stops are available in 54" and 57-1/2" in height. 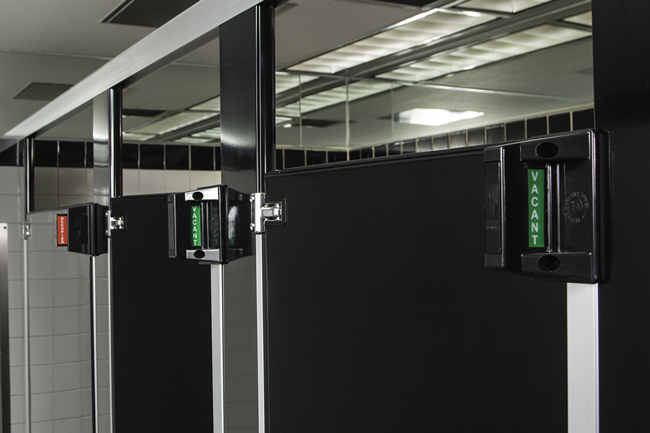 We just added Stallmate for partition doors, this unit holds your cell phone while in the toilet stall and can also act as a lock for the toilet partition doors. The Privacy Cover is Great for Bathroom Partition Door Gaps. Block's gaps between door and pilaster for both sides. Includes 2 per package, one for each side of door, 58" Tall. The Cover is just under 2" wide with the clear rigid vinyl mounting strip being 7/8" wide, and the cover being 1-1/8" wide. This product ships in an oversize box ground. The informational and installation video are shown in the Description Tab below. This product ships in an oversize box ground. Toilet partition continuous door stop for powder coated steel partitions, this has a slight round edge for attaching. The length is 57" and is used on a 1-1/4" slight round edge pilaster for mounting. Used with 1" doors and has a concealed turn latch with the pin coming out the center edge of the door. The hole spacing for the slot is 28-1/2" dead center of unit. The slot for the bolt to lock to is 7/16" wide x 5/8"ht. This helps with blocking the door gaps on the locking side of the door. This is made of brushed aluminum material and is used with in or out swing doors. Also known as Hadrian partitions part number 560058. Toilet partition door hinge side sightline filler for 1-1/4" thick powder coated steel pilaster post. This product has a slight round edge specifically for this material. The demensions are 1-1/4"x 54-1/2", this product is brushed aluminum and can be cut in the field. This product will help block the gap on the toilet partition hinge side. Known as 560458 from Hadrian partitions and can be used with other factories. Toilet partition full length aluminum door stop for 3/4" panel Inswing doors. This product is clear anodized aluminum. This full length door stop with block the gap between the door and the post next to it. For an inswing the slot is 3/8"x1-1/4" wide for the slide latch to latch it. The door keeper and strike is 57-1/2" in length and has 5 holes spaced at 14" apart and starts at 3/4" from the top and the bottom. Also known as 135974 strike & keeper channel. Includes all hardware. Toilet partition full length aluminum door stop for 3/4" panel outswing doors. This product is clear anodized aluminum. This full length door stop with block the gap between the door and the post next to it. For an outswing the latch locks on the back side of the bumper. The door keeper and strike is 57-1/2" in length and has 5 holes spaced at 14" apart and starts at 3/4" from the top and the bottom. Also known as 135984 strike & keeper channel. Includes all hardware. Toilet partition full length aluminum door stop for 1" panel Inswing doors. This product is clear anodized aluminum. This full length door stop with block the gap between the door and the post next to it. For an inswing the slot is 3/8"x1-1/4" wide for the slide latch to latch it. The door keeper and strike is 54" in length and has 5 holes spaced at 13" apart and starts at 1" from the top and the bottom. Also known as 134304 strike & keeper channel. Includes all hardware. Toilet partition full length aluminum door stop for 1" panel outswing doors. This product is clear anodized aluminum. This full length door stop with block the gap between the door and the post next to it. For an outswing the latch locks on the back side of the bumper. The door keeper and strike is 54" in length and has 5 holes spaced at 13" apart and starts at 1" from the top and the bottom. Also known as 134314 strike & keeper channel. Includes all hardware. Toilet partition full length aluminum door stop for 1-1/4" panel Inswing doors. This product is clear anodized aluminum. This full length door stop with block the gap between the door and the post next to it. For an inswing the slot is 3/8"x1-1/4" wide for the slide latch to latch it. The door keeper and strike is 57-1/2" in length and has 5 holes spaced at 14" apart and starts at 3/4" from the top and the bottom. Also known as 135744 strike & keeper channel. Includes all hardware.